You open the application, select an area to record, choose a filename to save it, and do your thing so it can record. However, this is Windows and OS X only - I've occasionally toyed with using a Linux VM and capturing the VM window, but I'd like a native alternative that would record a gif the same way. Update 10/13/2014: Version 2.0 released. Added options to create webm or mp4 videos instead of just animated gifs. Added a script to do a full install without root privileges. Update 10/4/2014: Runs in Unity, no problem, and there's now a PPA for installation - Thanks to Seth for his Unity Indicator patch and PPA. Please have a look at the installation instructions below which I've updated today. Also, you can run it without installing it. Follow the Any Linux Distro instructions, but don't run the install script. With Xfce, just open the extracted folder and double-click bash silentcast. With other desktops, run from the terminal from within the extracted folder. That's it! Nothing will be copied into your system files and deleting the extracted folder will completely remove it from your system. I wasn't happy with either of these answers so I wrote my own: Silentcast. Notice there's a stop icon in the Notificaton Area before I even start Silentcast, then a 2nd stop icon appears when recording begins. That's because I already had Silentcast running to make these animated gifs of how to use Silentcast. Silentcast 1 keeps going after I stop Silentcast 2. Extract. Then, from a terminal, cd into the extracted directory and sudo ./install Uninstall instructions are the same replacing install with uninstall. The install (or uninstall) bash script just copies (or deletes) files. You may want to edit them if your distro puts files in unusual places. Find Silentcast in the menu under either Graphics or Multimedia, type silentcast into the search box, or ALT+F2 silentcast. It can also be run from a terminal as silentcast. One possible solution is byzanz if you don’t mind using the CLI. Byznaz run on Ubuntu and I didn’t test it on different Linux distributions. I tested it only on Ubuntu 12.04 LTS. It's a rather rudimentary screen recorder with limited options. Byzanz records GIF's and runs in a terminal only. 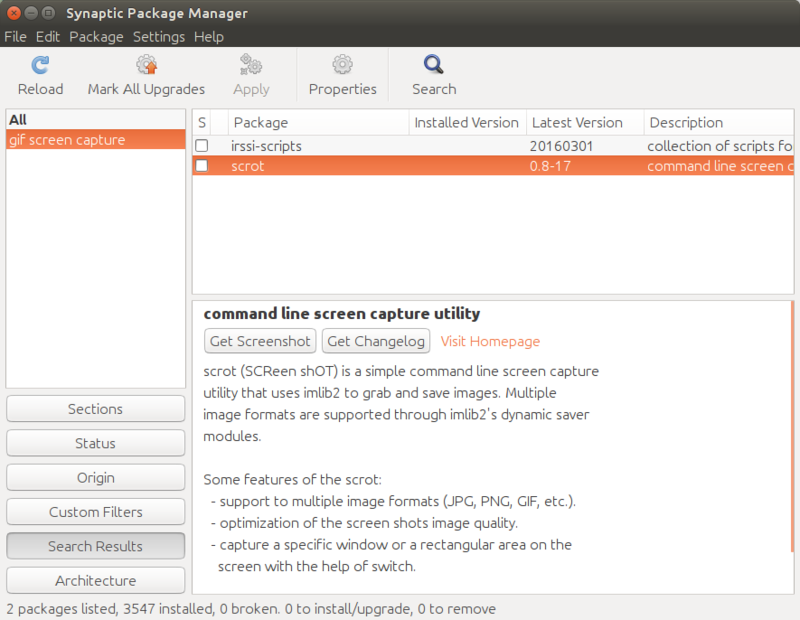 It is not included in Ubuntu repositories and it can be only installed through a PPA. This is on Arch Linux, 64-bit and wine 1.7.18. You could take a look at Peek too. Peek is a simple tool that lets you record a section of your screen and save it as an animated GIF image. Peek requires FFmpeg + ImageMagick to be installed and currently only works with X11 and is targeted at GNOME 3 (thus it should work even in Unity so long as you don’t have Locally Integrated Menus enabled). I Haven't seen it mentioned here, so try Scrot. I Have zero experience in using it, but I'll generally go with a distro package managed version over a third party ppa or repository 90% of the time for such software.